Polar bears are sexually dimorphic mammals in that males are significantly larger and heavier than females. They are nearly twice larger and heavier in comparison to the females. 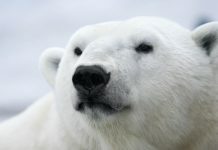 The typical weight of a male polar bear measures around 350–700 kg (772–1,543 lb). Males are highly aggressive but they usually avoid each other. However during breeding season male bears fight over the females. 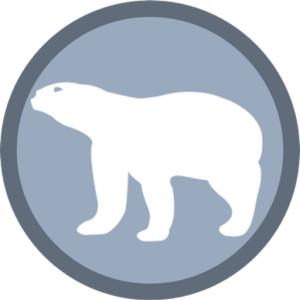 Male polar bears eat cubs especially when the food is scarce. 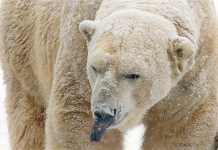 The cannibalism behavior is more likely to be observed in male polar bears than female polar bears. Male polar bear is called a boar. Adult male bears have shoulder height of about 122 to 160 cm (4 ft 0 in to 5 ft 3 in). Like females male bears also possess short tail measuring up to 7 to 13 cm (2.8 to 5.1 in). 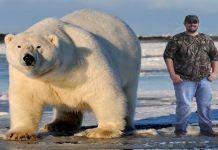 How Big is a Male Polar Bear? 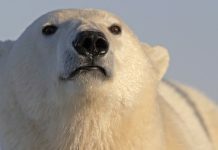 Main Article: How Big is a Male Polar Bear? The total length of a boar is 2.4–3 meters (7 ft 10 in–9 ft 10 in). The male polar bears are only slightly smaller than the male Kodiak bears. 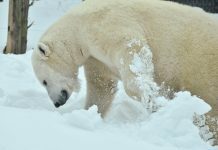 The male polar bear’s weight ranges from 350 to 700 kg (772 to 1,543 lb). 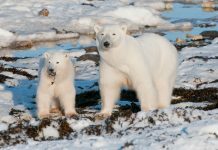 According to the Guinness Book of World Records adult male polar bears weigh up to 385 to 410 kg (849 to 904 lb) and a shoulder height measuring at 133 cm (4 ft 4 in). The largest male polar bear ever recorded was shot in the northwestern Alaska in 1960. The bear reached the height of about 3.39 m (11 ft 1 in) on her hind legs.